Flash coming to iPhone & iPad … ish! 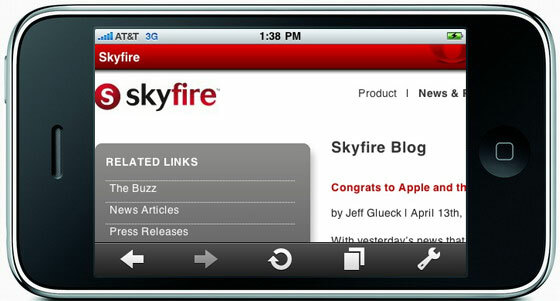 Three months ago I mentioned the Skyfire browser might be coming to iPhone soon. Well, now it has been approved by Apple and is expected to appear in the App Store on November 4th with a price tag of $2.99 in the US App Store. Skyfire has a trick up its sleeve. It doesn’t fully support Flash, it just converts Flash to HTML5 on-the-fly through Skyfire servers. It doesn’t work with any “interactive” Flash files, such as games etc., it’s only Flash-based video that’ll work. MobileCrunch tested a preview version and found playback not to be completely smooth, but it apparently works fine on Android so it’s probably going to work fine on iPhone too. Adobe claims (or used to claim?) that 75% of all online video was in Flash but a recent study by Mefeedia shows that over 54% of the videos are in fact HTML5, compared to 26% in May 2010 and just 10% in January 2010. A huge boost for HTML5, mostly thanks to mobile devices supporting – and needing (iOS) – HTML5 for most video playback. That’s a really nice work around and pretty cool to see the actual stats on Flash – can’t wait to see more HTML5 because Flash just seems so bloated especially with so much more video on the web these days. I’ve been looking forward to Skyfire while now. I’m so tired of Safari’s slow performance and frequent crashes. So glad that Apple finally approved Skyfire and I will be purchasing it on Thursday. There are great alternatives to Safari, and if you have jailbroken your iPhone / iPod, it’s possible to replace the “default” browser. Also, some other ones on the Apple store work just as good. The Apple vs Adobe nonsense is just embarrassment….for Apple. Why is it embarrassment? I think that Apple should develop the function of using Adobe because it is convenient! And Skyfire is just a temporary solution. It’s an embarrassment for Apple because they should just concentrate on their software and hardware and quit trying to maliciously out others out of business, and/or control things they have no business trying to control. skyfire was pulled of app store few days back , now its back , but in batches …. SkyFire is an interesting idea; I wonder how well it will work in the mainstream. Ha, guess which browser I’m using? It was worth the buy – buy it now before the price raises! I can now watch videos I normally can’t because of Safari restrictions. If only you could set a ddefault browser on your iPod / iPhone. Previous post: Photoshop vs Photoshop Elements: Which One Is Right for You?